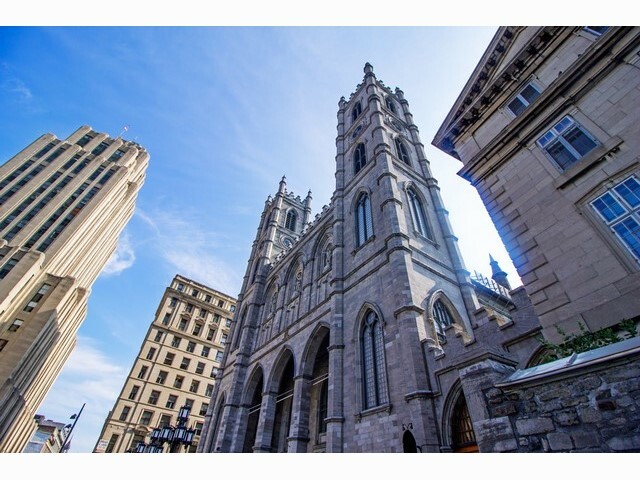 The history of the Notre-Dame parish is intertwined with Montreal’s own, which was founded in 1642 by French named Maissoneuve. 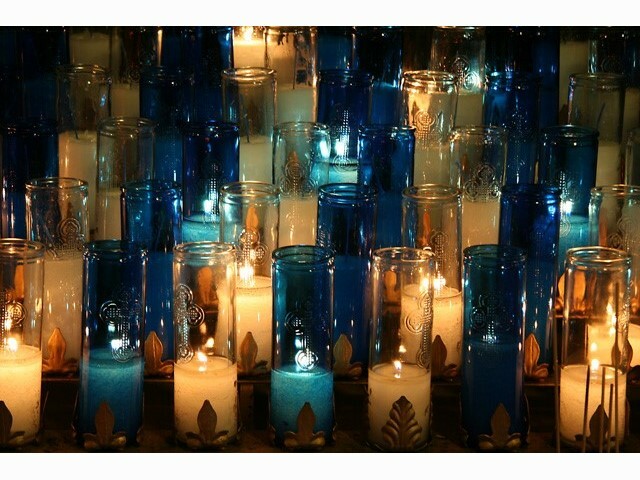 Up until 1659, the faithful gathered in a modest wooden chapel. 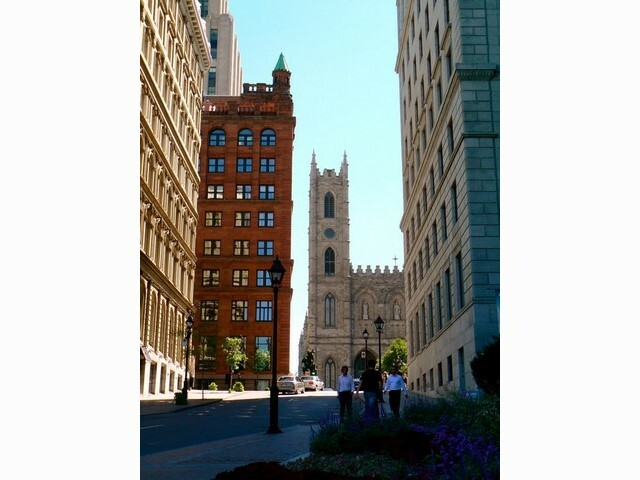 It was operated by the Jesuits until the Sulpicians’ arrival in Ville-Marie (Montreal) in 1657 when they took over the parish. 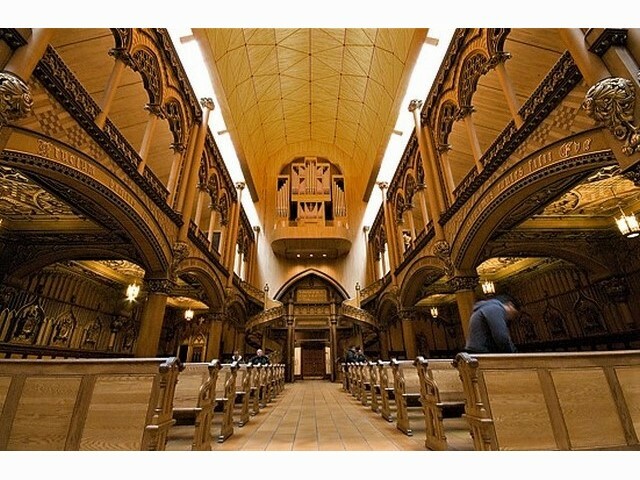 Another chapel was then built, adjacent to the city’s first hospital, the Hotel-Dieu. The construction of the Stone church took place between 1672 and 1683. 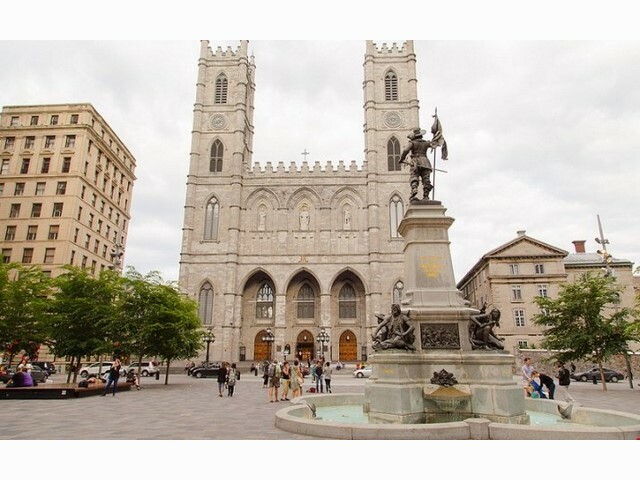 It was located right in the heart of Notre-Dame street. 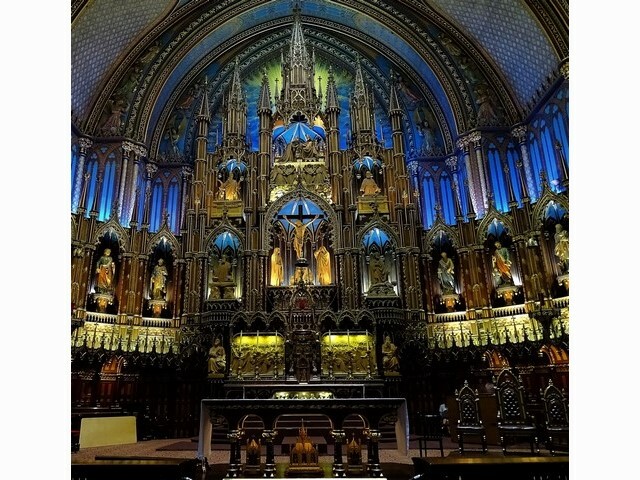 Around 1800, many parishioners had to listen to the mass from the parvis, since there was not enough room inside the church. Reconstruction was often discussed but it wasn’t until 1823 the church wardens approved the plans for the existing church. 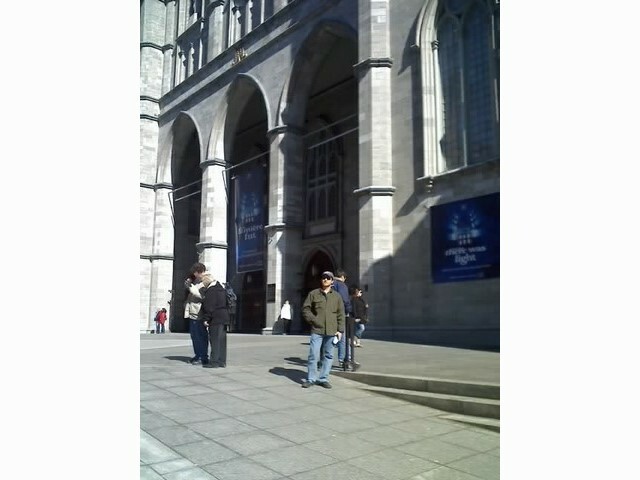 The basilica’s architect was James O’Donnell, an Irish protestant living in New York. 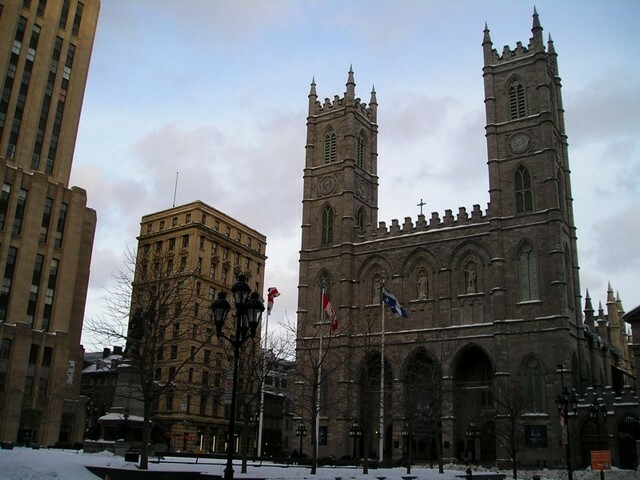 He moved to moved to Montreal to oversee the work, converted to Cat holism and died in 1830, just a few months after the church’s inauguration. The construction of the towers began in 1841 and was completed in 1843. The western tower, named Perseverance, houses the great bell, which weighs 10, 900 kg. The eastern tower, named Temperance, houses a carillon with ten bells. 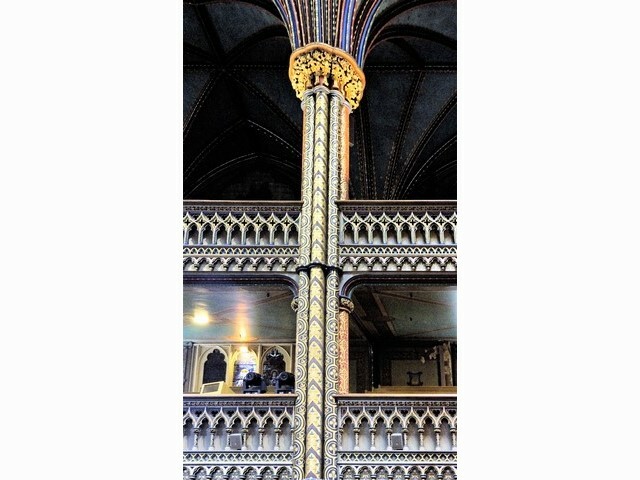 Benjamin-Victor Rousselot, Notre-Dame’s parish priest between 1866 and 1882, supervised the beautifying of the building’s interior, which was inspired in great part by the Sainte-Chapelle in Paris. 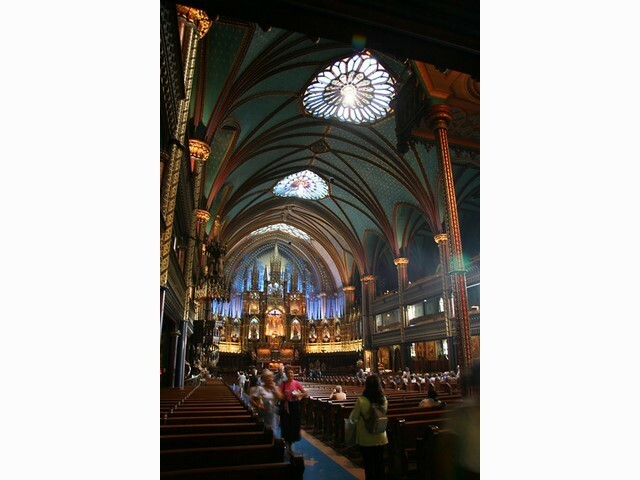 Mr Victor Bourgeau, the diocese’s most prolific architect, was hired by Mr Rousselot, and he designed the basilica’s existing decor. He submitted his project in 1869 but the actual work did not begin until 1874 and was completed around 1880. Cure Rousselot and Bourgeau commissioned a Frenchman, Henri Bouriche, for the altarpiece sculptures. Mr Rouselot imagined an altar with a centrepiece illustrating the Eucharist, which originated in Christ’s sacrifice. The sacrifice is first mentioned in the Old Testament and is illustrated in the four sculptures surrounding the Crucifixion. In the bottom left-hand corner, Melchisedech is seen offered bread and wine. Above Moses places an urn full of manna in the Ark of the Covenant. In the bottom right-hand corner, Abraham prepares to sacrifice his son Isaac while above him, Aaron sacrifices a lamb. At the very top of the Altarpiece, Mary is seen being crowned by her son. The six polychrome statues represent Saint Peter and Saint Paul as well as the four evangelists, Mathew, Luke, Mark and John. Viewed 120 times since 23 January 2019.